At some point, the primal urge to sharpen something rises and something gets sharpened. For those of us who sharpen knives on a regular basis, we know that it is a journey, one that often starts in a similar space but soon splits into different directions. It is a journey with a beginning and for some, it has no end, but where does it start? Whenever I am sharpening knives in an area where others can watch, and this happens regularly for me, a common scenario unfolds: A person, often older and almost always male, will stand and watch me sharpen on my Japanese Water Stones and then tell a story where the first time he saw this happen was watching his father or another elder sharpen an a long time ago. This happens over and over again and it is the same for me. I watched my father sharpen a chisel on a old beat up oil stone of unknown make and grit but that moment was etched into my memory and that is where my own journey began. Countless men have told me similar stories and for countless men, that is where their journey started and came to an end, even though I am absolutely convinced that at some point in time, that primal urge to sharpen something rises and something gets sharpened, good or bad, the thirst for sharpening is quenched for most and it ends there. Why men and not women one would ask, I have asked that question and I think I may have an answer: Like so many others, the ignition point for my quest to sharpen knives was the moment I saw and heard my father sharpen a chisel and I really believe that both of those senses were of equal importance, they played pivotal roles during that scene. I don’t ever remember my sister going out to my fathers workshop to watch what he was doing, she had other interests, maybe she was with my mother. If that is the case for me, maybe that is another common experience for most because as I said, no female has ever shared a similar experience with me. Of course there are female sharpeners out there, I am just talking about my experience and the multitude of similar conversations I have had over the years. I just think that for those females who sharpen knives, their journey started a little later in life. I can easily remember periods in my life over the last forty years where the urge to sharpen a knife got the best of me and I was out searching for something to sharpen and for something to sharpen on. In those days, there were no computers, no YouTube (the good old days), so my learning was pretty much hit and miss, not even sure if the beginning years resulted in anything that we would call sharp now. All I know was that I had to sharpen a knife and the passion for that process, as unskilled as I was, was growing and it was growing rapidly. I soon found myself alone in that respect, nobody I knew was interested in the process. I believe we all have a passion for knife sharpening, we all took that first step and most of us took different paths but it is that primal sharpening instinct that we were born with that motivates us to do what we do. We all know that early man used knives, probably obsidian and likely razor sharp and that sensation of using a sharp knife/tool is perhaps where sharpness began. It had to start somewhere and thankfully it did because as you all know there is nothing quite as satisfying and rewarding as making a dull knife sharp. As years pass, after the first exposure to sharpening, some folks just sharpen a few knives once or twice a year, some never sharpen a knife despite sharing similar experiences. They may think it is a good skill to know but life presses and other priorities evolve. For some however, other priorities become minor priorities, that passion that started years ago is now unstoppable. We do what we need to do but always in the back of our minds, we know we have our obsession to feed and it becomes a shelter in the storm. We go through life like everyone else but not everyone else has that rock to lean on. It is like a guitar player, my sons both played and whenever things got rough, a bad day at school, their medicine was their ability to play the guitar. I truly believe that almost all men at some point in their lives have the urge to sharpen a knife, so for me that urge just stayed active, it didn’t go away and in fact it got to a point where I was buying new knives and breaking the tips off of them with pliers and a vice so that I could figure out how to fix them. Whether you sharpen occasionally or every day like me, the key factor to sharpening success is the passion behind the art, yes you can sharpen a knife and have the TV going on in the background and just get it done and you will have a sharp knife if your technique is sound. However…..if during that moment of sharpening a knife you forgot that there are TV’s, if the synergy that builds between you and the knife and the stone is the only thing that exists in that moment, if you are experiencing pure joy in that zen moment because your passion drove you there than I believe that knife is going to be truly sharp. I’m a “Blackhole” sharpener, from the moment my edge hits the stone, nothing else exits and all I want to hear and all I will hear is that edge moving through that water from one end of the stone to the other and after thousands of knives I still get excited when I am done and the “lights come on” and I’m back. We have all experienced this and this is what separates us from that guy who sharpen a knife once a year. (I love that guy by the way, at least he or she is sharpening a knife). This entire life changing process is no different than someone who started playing the piano at 7 and after 35 years still plays every day, it is a scene that repeats itself over a vast number of interests. Some just get obsessed with the path chosen and we are lucky enough to have chosen knife sharpening. In the beginning, it was just that, how to sharpen, over time it became of part of your life, people rely on your skill, you make people happy every day, you are the one that continued on the journey and there is a not day that goes by that you are not grateful for choosing to become a knife sharpening artist. 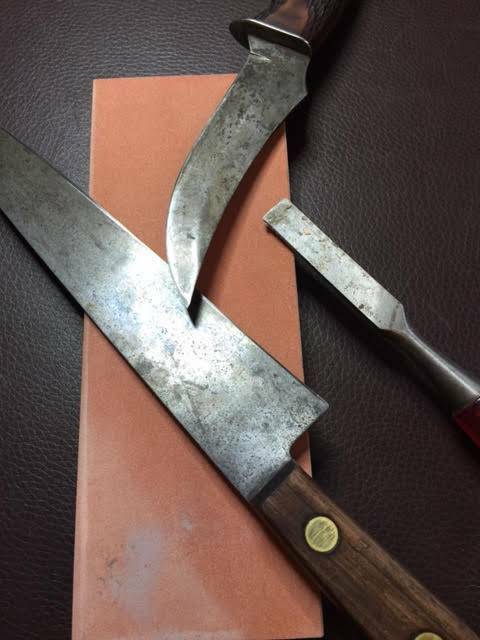 Clearly there is more to sharpening knives than the process itself, i.e. the act of making a dull knife sharp, there is more if we let there be more and we should. My journey started as a memory, it was that memory that is the catalyst for what I treasure most which is not my ability to sharpen knives but the passion I have that makes that ability much more than creating sharp edges. The essence of sharpening is founded on many levels with skill being but one of them. in many cases, adds to the sharpening experience. I began and I assume many others did by learning to sharpen a knife with the bare necessities, a stone, oil (back then), a dull knife and a low level of skill based on my memories of watching my father. However, that was enough, it was all I needed and even then, the process itself was so enjoyable that I was driven to improve. 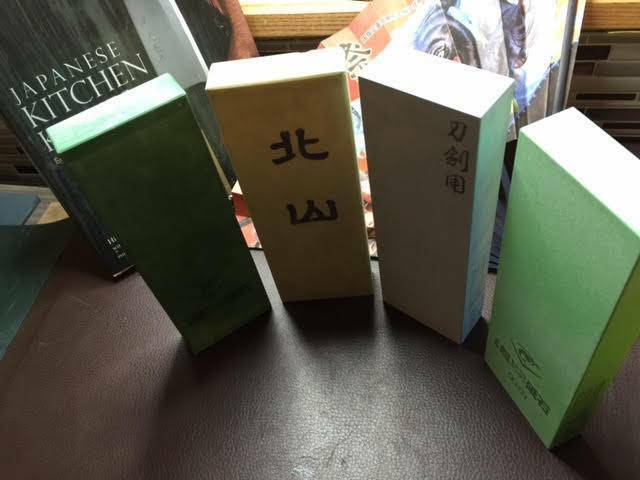 So, many years later as I discovered Japanese Water Stones I began to accumulate them, my little world was growing. I met Mr. Ben Dale (via email) and purchased the Edge Pro Professional, even though by that time I was pretty good with freehand sharpening on stones. However, the Edge Pro was another skill building block and my trust in Ben and his product made me a better sharpener, a better freehand sharpener. I don’t use the Edge Pro much now but it is important to me, the knives I sharpened successfully created layers of confidence, an ingredient crucial to success. 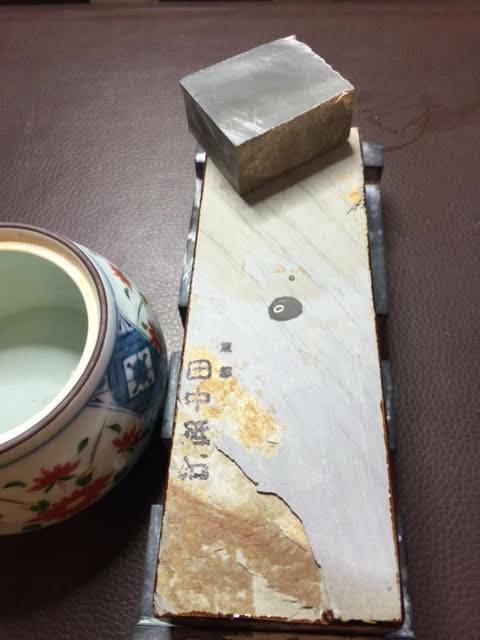 I moved on to gathering Japanese Water Stones, I had a life changing encounter with a Japanese sharpener who introduced me to pressure variances and that developed into a critical component of my sharpening process. 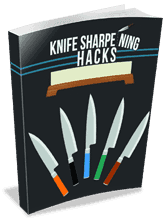 So like so many others consumed with knife sharpening I created the perfect sharpening setup, I created many perfect sharpening setups as I realized the first five were not so perfect. I now have my “Area Zen” and I spend many many hours in there. I know that we all go through this. 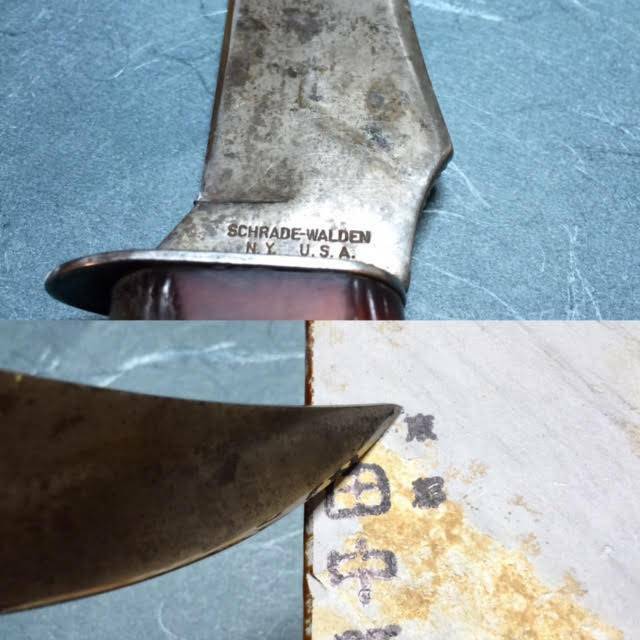 I had an elderly lady bring me a very old knife that was given to her by her late husband when they got married over sixty years ago, it was a beautiful carving knife with a bone handle that had never been sharpened after the purchase. The act of handing that knife over to me represented more that just that, it involved her asking her family to research knife sharpeners, to make the call, to trust me enough to hand over something precious. These moments repeat themselves over and over so it is our duty to not just take the knife and put an edge on it but treat that knife as if it is the only thing that is important and reach a point where you look forward to giving it back because that moment is going to mean so much to that individual, her apprehension will vanish as the “new knife” is revealed to her and her smile will light up the room. Your reward is the sensation of satisfaction that you know will be repeated many many times. These moments are what keep the passion building, but we need to pause and let this happen. There are two paths to take for sharpeners once a certain level of skill is reached, the “business sharpener” who makes knives sharp for people and gets paid for that and they go home and don’t think about sharpening until the next day. Then there are artisans who reach a level of skill and soak in all the collateral elements of the process, the rewarding moments, the fact that people trust you enough to bring their knives because “they’ve heard of you”. 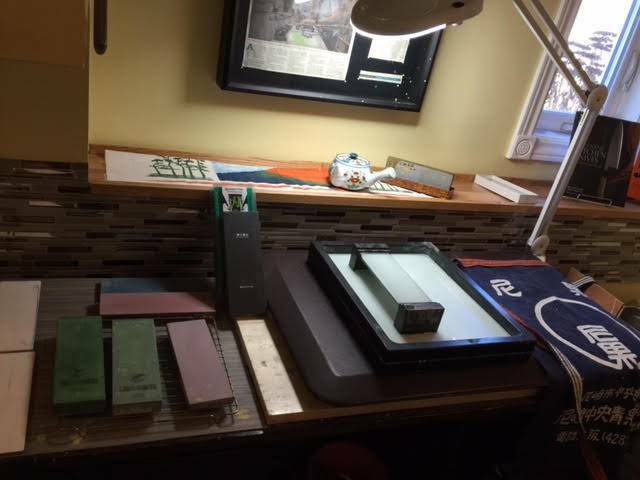 The stones, the sharpening station, the feeling of making a knife sharper than people have ever seen. Basically, the passionate knife sharpeners who also may do this as a business like myself but truly appreciate what it is all about. 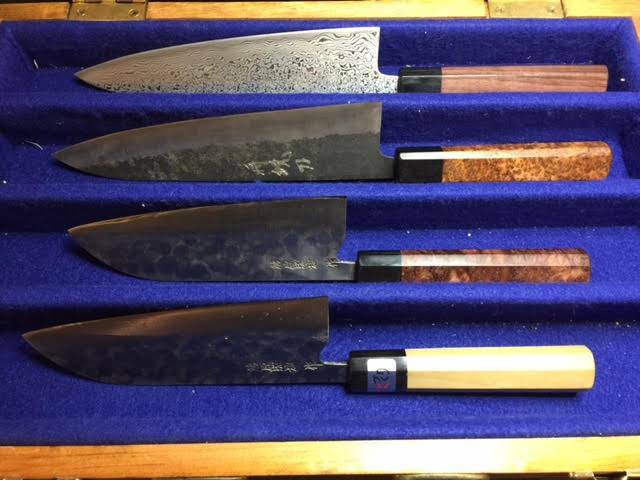 The purpose of this article is not to instruct anyone on anything related to knife sharpening but simply to share what is in my opinion the essence of sharpening, what lies beneath and breaths life into the passion and propels us to keep doing what we do. Does having this passion and appreciation for all of these things make me a better knife sharpener?